Looking for a quality partner for your graphic designs? We're here! We provide you with assistance in designing and manufacturing the layouts for al your printwork. Our extensive experience provides you with certainty that you can trust us to produce your work. Take a peek in our portfolio. You are in advertising or printing and you need help with desktop publishing or(web)design. 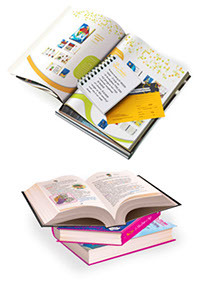 You are in publishing and need extra hands for the design or layout of books or co-editions including bookcovers. You are entrepreneur and you could really need some help with your company branding, advertisements or office publications.